Downtown west Austin is a quiet neighborhood in the heart of the city, home to restaurants, stately homes and a wealth of well-preserved history. The neighborhood, along with the rest of downtown Austin, was first planned in 1839 as a 14-block metropolitan area, designed to become the capital of the Republic of Texas. During the late 1840s, it quickly became the epicenter for hotels, locally-owned businesses and saloons. 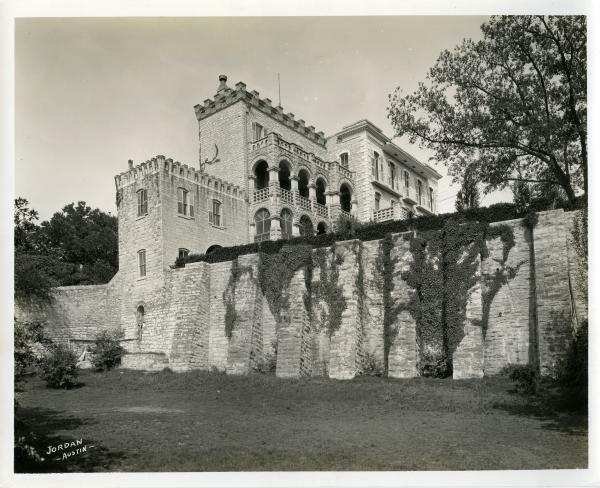 Austin Woman&apos;s Club at the North-Evans Chateau Bellevue. C01575, Austin History Center, Austin Public Library. By the 1980s, it was estimated that only 3,000 people lived in the downtown area, a drastic decrease from the 12,400 who lived in downtown during the mid-1940s. This drove the City of Austin to establish a 24-hour community that extended the business hours of many restaurants, shops and bars, which successfully attracted both locals and visitors. Despite the changes that the neighborhood has experienced, downtown west Austin still maintains a major part of Texas history. Marriages joined the families of successful merchants, John Robinson and John Bremond, who then created a family compound in downtown west Austin. The oldest standing house was built by Abner Cook in 1855. Architect George Fiegel’s Victorian styling predominated from 1873 to 1887. Boundary: Guadalupe, San Antonio, West Seventh and West Eighth Streets. Privately owned buildings, viewable from the street. Ira Evans was a prominent banker, legislator and advocate for freed slaves. Upon purchasing this 1874 Victorian Romanesque castle in 1882, he hired architect Alfred Giles to improve the house, resulting in its dramatic appearance today. It has been the home of the Austin Woman’s Club since 1929. Cordova shell limestone, with fossil imprints, was used by Page Brothers Architects for Travis County’s 1931 courthouse. In 1946, Herman Marion Sweatt, backed by the NAACP, sued the University of Texas for admittance to its law school. The case, argued here by Thurgood Marshall, moved the U.S. toward equality in education. This 1933 Italian Renaissance building, once Austin’s main library, was designed by Hugo Kuehne, first Dean of the UT School of Architecture. Frescoes, ironwork and wood carvings were done by Austin’s finest craftsmen. Interesting exhibits and events recapture Austin&apos;s past. Prominent Austin families lived on this high ground northwest of Capitol Hill, in homes dating from 1850s to the 1900s. Today, the Daniel H. Caswell House host weddings, events and tours. Approximate boundary: West 14th Street to MLK, Jr. Boulevard; Rio Grande Street to Shoal Creek. Republic Square and Wooldridge Square Parks have been designated open spaces since Austin was founded in 1839. The first city lots were sold from under the live oaks in Republic Square Park in 1839. Guadalupe Street, at West Fourth Street and West Ninth Street. Learn more about Historic Austin with a guided Downtown Walking Tour!